When this movie was released in theaters, it was a big deal. Jason's story was supposed to have ended two movies ago in The Final Chapter, with Tommy's story taking over the series in A New Beginning. Tommy's story continues for a third movie in Jason Lives but now Jason's actually back. And it's Tommy's fault! This was the pop culture event of 1986! The commercial with Jason standing on top of the burning camper aired seemingly almost constantly, Alice Cooper did the theme song, and I couldn't see it because I was only ten. Especially not after the little freak-out that I added to a Saturday afternoon showing of The Ghoulies: I didn't make it past the first scene before running to the lobby and having my sister, who accompanied me, call my mom to pick us up. I was shocked that it wasn't anything like Gremilns, and to this day, I'm not sure if my poor sister ever got to see that glorious ghoulie emerge from the toilet bowl just like on the poster. I sure didn't. So, with the understanding that absolutely nobody was going to take me to see this one, I waited patiently. I caught it couple of years later on Channel 11, known to New Yorkers as WPIX, and recorded it to enjoy over and over again. It wasn't until I purchased a copy of the VHS tape at Saturday Matinee a few more years after that that I realized the Sheriff's voice was dubbed in the TV version. No wonder it always seemed out of sync. 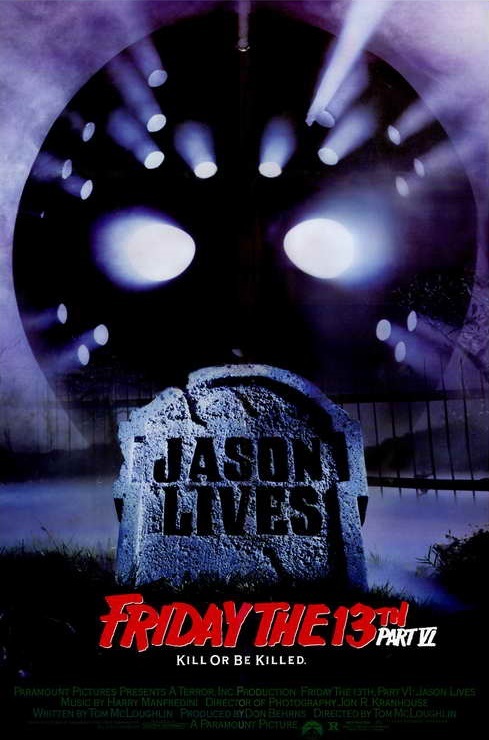 Having seen Jason Lives as my first Friday the 13th movie, I always think less of the first five. Seeing Jason run around as a tall, lanky dude lurching out at counselors with his dirty fingernails is just off-putting after witnessing the stoic, unstoppable monster portrayed in this one. Kane Hodder was by far the best Jason, but unfortunately none of the movies that he portrayed him in were as good as this one with CJ Graham behind the mask. Although every single Friday the 13th movie has a shot of Jason without his mask and every single one has a different face, this Jason doesn't have a Sloth eye or untamed tuft of hair sticking out from one side of his head. This one has a rotten face with maggots writhing all over. And spiderwebs. Plus , we saw it right at the beginning of the movie before he even put the mask on! Zombie Jason is the new hotness and it changed everything. Surprisingly not one of the portrayals of Jason Voorhees. The previous film, A New Beginning, set up the premise that Tommy would become the new killer or 'Jason' in this movie. Thank goodness Roy was met with disdain or this would have been completely different. With good reason, it's unbelievable that this is supposed to be the adult version of Corey Feldman and the same character from A New Beginning, Thom Mathews' performance is fantastic, as was his chemistry with Jennifer Cooke. Plus, this was the guy from Return of the Living Dead! Perfect casting for a non brooding Tommy Jarvis that just wanted one thing: To confirm that Jason was dead. But now that he brought him back to life, he just wants to take him out again. Keep it simple, right? Friday the 13th movies have never been preceded by the words "For your consideration", but Jason Lives did more with the budget than all of the previous entries and, more importantly, it was fun. The paintball scene, the car chase, the James Bond spoof in the opening title. The movie wasn't afraid to change the atmosphere of Friday the 13th movies and we even saw a side of Jason that never existed: Compassion. The unstoppable killing machine now has boundaries. He won't harm children. Thank goodness, because 13 year old me wouldn't have been able to sleep without every light on had it not been for that tidbit. Thank you for including that, Tom McLoughlin. Jason Lives is the gateway Friday the 13th movie. You'll become a fan upon first viewing, but just don't expect the others to hold up to this one unless you're a fan of the genre. If you need a good starting point or just want to experience the series, here you go. Just watch and have fun.